Rosann Tung is director of research and policy at the Annenberg Institute for School Reform at Brown University. English language learners (ELLs)1 are the fastest-growing group of students across the nation, not only in large urban districts, but, increasingly, in small urban districts and suburbs. Much is known about how best to educate ELLs from academic research. However, the research-practice gap is wide, and resources and political will are too low for promising practices to be systematically implemented in teacher preparation and development programs, encouraged in state and district policies, and enacted in schools and classrooms. Most states and districts lack a vision for ELL education that builds on families’ cultural and linguistic assets. They also mostly underfund ELL education and adopt primarily subtractive ELL approaches, in which students lose their first language and identity and are immersed in English-only environments. The role of the ELL leaders in most states and districts is marginalized rather than elevated and is focused on compliance rather than asset and capacity building. The national context that encourages neglect of ELL education includes the accountability movement, which emphasizes annual testing in English exclusively (e.g., the No Child Left Behind Act of 2001); the recent adoption of Common Core State Standards (CCSS) by most states, despite the acknowledgment that there are no provisions in the CCSS for ELLs; and the adoption of explicit English Only legislation in California, Arizona, and Massachusetts. Nor has higher education aligned its pre-service teacher education programs to foster understanding English language acquisition and linguistic developmental milestones. The teaching force has not received adequate professional development for educating the ELL students who are currently in almost all classrooms. All too often, as a result of this neglect, many ELLs languish for much of their K–12 careers in separate classrooms, unless they drop out before graduating, as disproportionate numbers of ELLs do (Kim 2011; Uriarte et al. 2011). Thus, we need to shift the paradigm by increasing the opportunities and choices for students and families to those that support the acquisition of academic English, while simultaneously developing the students’ native language and teaching the students content. We need to create district and school cultures that celebrate and value linguistic and cultural diversity. U.S. Secretary of Education Arne Duncan recently acknowledged the need to maintain ELL students’ first languages: “[It] is clearly an asset that these kids are coming to school with. . . . The fact that our kids don’t grow up [bilingual] puts them at a competitive disadvantage” with other countries where students learn at least one other language (Maxwell 2013). In order to effectively teach English and maintain heritage language, we also need to adequately fund teacher preparation; innovative curriculum, instruction, and assessment; and research that leads to a deeper understanding of how and under what conditions students acquire a second language. When my son gets home, he hangs out with friends in the neighborhood who are also Vietnamese, but they don’t speak Vietnamese. They all talk to each other in English. In the car, I want them to talk in Vietnamese, but they don’t want to. They turn around and talk in English. As a result, children of immigrants not only lose the ability to communicate with family members, but they also undergo a period of not being fluent in either language (Portes 1998; Wong-Fillmore 1991; McLaughlin, Blanchard & Osanai 1995). Their communities, their academic learning, and their cultural identity suffer because of their language loss. This issue of VUE examines different aspects of asset-based education for ELLs. First, three authors share unique aspects of their school models, which all highlight the value the English language learner students bring to their school communities. In addition, in the dual-language models, native English speakers learn how it feels to be language learners. Julie Nora shares examples from her dual-language elementary school, and Dania Vazquez from her dual-language high school. Claire Sylvan shares elements of a successful school model for recently arrived high school students. In all of these exemplar schools, newcomer ELL students’ languages, cultures, traditions, and ways of thinking enrich everyone’s learning. Two Perspectives sidebars highlight the kind of preparation and professional development that makes for effective ELL teachers. Sarah Ottow shares community-based pre-service teacher preparation model that empowers bicultural, biliterate adults to become excellent teachers. Beth Warren and Ann Rosebery describe their in-service professional development model and research expanding teachers’ views on their English language learner students. These two innovative strategies develop excellent, open-minded teachers who are also adult learners, constantly refining their practice as they learn from their students and their students’ experiences. At the district level, two ELL administrators share their strategies for improving ELL education systemwide. Lucy Keaton shares her strategic plan for Clark County School District, which includes raising cultural competence among teachers, involvement among families, and early literacy strategies in elementary schools. Nicole Chaput Guizani focuses on how higher education partners in Nashville have built capacity in the district through professional development and ESL endorsement opportunities for current teachers. Outside of schools and districts, community-based organizations and states are also grappling with the changing demographics in our cities, and federal policy has not caught up with the burgeoning ELL population. Elaine Ng shares her forward-thinking, community-based organization’s efforts to meet its families’ needs by teaching and empowering immigrant parents to advocate for their public schools. Sonya Douglass Horsford and Carrie Sampson expose the lack of federal and state guidance on funding and supporting ELL education, and therefore the wide variation in funding in the ten states with the highest growth of ELL student population in the last decade. Jaime del Razo describes some of the misperceptions about undocumented students, the assets they bring to their schools, and policy changes needed to address this underreported issue of college access for undocumented students. Rather than write about ELL education as a problem, dilemma, achievement gap, or crisis, these innovative practitioners, scholars, and policy analysts shift the paradigm, reminding and urging us to embrace ELLs as the very community members who, when well educated, will be the bicultural, bilingual leaders who improve our city neighborhoods and help us participate effectively in the global economy. Strikingly, this diverse group of innovators shares one goal: to increase educational equity in opportunities and outcomes through practicing and promoting an asset-based view of our bicultural English language learner children. That they do so in spite of the context of federal and state policies that cast ELLs in a deficit framework is impressive and inspiring. We hope to deepen readers’ understanding and increase the political will to provide resources and implement the best practices that research has shown to be effective for these vastly underserved students. 1. English language learners are those students whose first language is not English and who are in the process of acquiring English. 2. The author is a research fellow of the Institute for Asian American Studies at the University of Massachusetts, Boston. Kim, J. 2011. Relationships among and between ELL Status, Demographic Characteristics, Enrollment History, and School Persistence. CRESST Report 810. Los Angeles, CA: University of California, National Center for Research on Evaluation, Standards, and Student Testing. Maxwell, L. 2013. “Arne Duncan Touts Advantages of Bilingualism,” Education Week blog (May 30). McLaughlin, B., A. Blanchard, and Y. Osanai. 1995. Assessing Language Development in Bilingual Children. Washington, DC: George Washington University, National Clearinghouse for Bilingual Education. Portes, A. 1998. “Social Capital: Its Origins and Applications in Modern Sociology,” Annual Review of Sociology 24:1–24. Uriarte, M., F. Karp, L. Gagnon, R. Tung, S. Rustan, J. Chen, M. Berardino, P. Stazesky, E. de los Reyes, and A. Bolomey. 2011. Improving Educational Outcomes of English Language Learners in Schools and Programs in Boston Public Schools. Paper 154. Boston, MA: Gastón Institute for Latino Community Development and Public Policy, University of Massachusetts Boston. Wong-Fillmore, L. 1991. “Second Language Learning in Children: A Model of Language Learning in Social Context.” In Language Processing in Bilingual Children, edited by E. Bialystok, pp. 49–69. Cambridge, UK: Cambridge University Press. 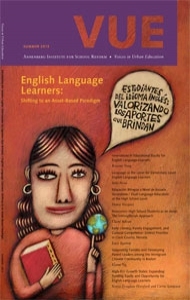 Rather than viewing educating English language learners as a problem, this issue calls for embracing and valuing ELLs as bicultural, bilingual leaders of the future.